Compared to 10 years ago, the best off-road vehicles are quickly going extinct thanks to the rise of the crossover, but fortunately there are still several car companies producing vehicles which handle off-road terrain as well as they do tar roads. Here’s the best of what 2018 has to offer. With extended bodywork to accommodate 31” Goodyear tires, the ZR2 rides on fortified suspension which incorporates Multimatic DSSV shock absorbers and has a 2.8L turbodiesel 4-cylinder engine, offering an incredible 369 pound-feet of torque. The most capable compact crossover on the market, the 2019 Jeep Cherokee Trailhawk comes standard with 4-wheel drive, fortified suspension, and a locking rear differential. Selec-Terrain technology allows the driver to choose from different driving modes including Auto, Snow, Mud, Sand, and Rock, and the 2.0L 4-cylinder engine is rated at 270hp. Built for off-road top-less and door-less motoring, the Jeep Wrangler is the most iconic off-roader of our time. The Rubicon edition benefits from heavy-duty axles, skid plates and a trick system which allows the driver to disconnect from the front sway bar, while the base-model is a blank canvas for drivers looking to make their own modifications. While fuel efficiency has never been one of the Range Rover’s strong points, the latest model is much more mindful of this owing to a smaller engine and the widespread use of weight-saving aluminium – which means more bank for sports betting NZ! The turbodiesel engine option provides incomparable low-end torque perfect for bouldering and there is even a hybrid, gasoline-electric plug-in model called the P400e. Widely used as a military vehicle by many nations over the past few decades, the G-Class – short for Geländewagen – is one of the most rugged vehicles ever built and is still entirely built by hand in Graz, Austria. Featuring full body-on-frame construction, the G-Class has 3 differential locks, solid axles, and skid plates. Virtually unstoppable on off-road terrain, the 2018 Nissan Armada is a body-on-frame monster which relies on a 5.6L V8 engine, producing 390hp and 401 pound-feet of torque. The advanced 4-wheel drive system sends the engine’s power to the rear wheels under normal driving conditions to save fuel, but effortlessly transfers the power automatically when it senses that extra traction is required. Available either as a quad cab with a 6’4” bed or as a crew cab with a shorter 5’7” cargo compartment, the Rebel is the most capable of the Ram 1500 range. The 4-wheel drive only Rebel comes standard with a V6 engine, 33” Goodyear tyres, skid plates, and performance-tuned suspension. The best in the Toyota 4Runner range is the TRD Pro which has raised suspension for an extra inch of clearance, Blistein shocks, and fortified springs. 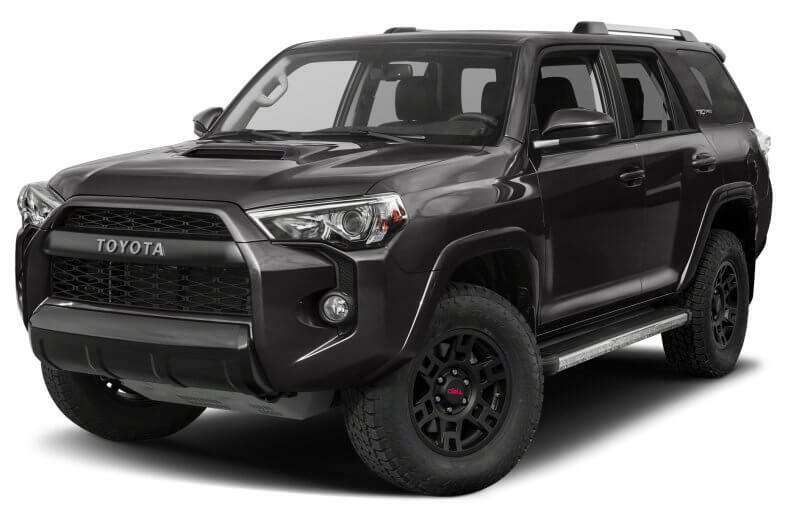 It may be more expensive than the standard 4Runner, but knowing that you’ll be able to traverse the desert without cancelling the factory warranty is absolutely priceless.